My Review: Warning! This review contains spoilers! The characters in this story were really interesting. 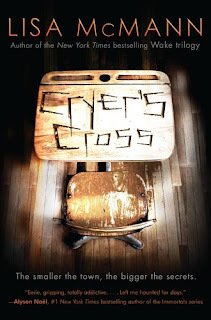 Cryer's Cross was written in a weird kind of 3rd person. It followed mostly Kendall but then would include something about the other characters, and then there was a chapter now and then told in the perspective of the murdered souls.It seems like I always identify more easily with 1st person narration, and this odd 3rd person narration was very different, so it took me a little bit to jump into the story. I felt a little detached from the characters at times, but you still feel this powerful pull to them and to the story itself.... Kendall's OCD is endearing rather than annoying like some characters with mental illnesses that I have read. She has quite a few ticks and routines that have to do with school, but you don't get a whole lot of it elsewhere until the very end. I like that the thing that saves her from being killed by the "ghosts" is the very thing that hampers her every day life. Jacian was a really interesting character too though I wish we would have seen more of him. He has issues and problems and is hella complicated, but in a good way. We get a little less depth with his character, but I think that is just because of the length of the novel. I loved how Kendall and his relationship grew from a mutual love of soccer, though his cocky comments had me wanting to punch him in the face at times. If he would have had a few more scenes he might have been this week's book boyfriend...idk...he still might lol. Well, the concept of a haunted desk is certainly original. I personally feel that objects that have had great evil done around or on them can carry a mark of that blackness forever. It's why you get the chills when you see a hanging tree, or walk through the prisons like Alcatraz, or in my case, the Indian Boarding School located 5 miles from my university where the Chippewa Indian tribe's children were forced to live up until the early 70's until in became an insane asylum until the late 90's (I kid you not people...I live within walking distance of this terrifying place). Anyways, it's quite believable that something that was so closely tied to hundreds of murders could carry a piece of those victims inside them, however I would have liked to see more of what the motive was for stealing the children of the local town. Like, did they need a death to equal out their own terrifying demise? Did they want someone to know what happened to them so they drew people in? It seemed quite odd that they just called the kids into the graveyard to rot on top of them. I would have liked some more information on that, but overall it was a really interesting idea. YAY!! I totally just bought this one this weekend!! Sounds like a good book, I'll definitely have to go out and get this one. Excellent review gonna ad to my list! This one sounds pretty cool. I'll have to check it out! this book sounds very, very good...can't wait to read it! Wow this book sounds really good, and creepy. I love the mix of paranormal with OCD (which I am interested in). I have been dying to read this book. It feels like it has been on my booklist forever. This sounds like a really exciting book! The cover didn't look really interesting to me, so I've postponed getting it. Now I'm dying to read it. It's getting bumped up on my reading list! This books looks SO good. Thanks for the review! the synopsis sounded good, but then when i saw you comment on horror then that makes this a no go for me. not into horror novels or movies. I haven't read this book yet, but this sounds like a creepy, creepy story! The haunted desk sounds so woah! I loved Lisa McMann's Wake series so this must be a great book! I just won this book in a giveaway, glad you gave it such a good review or I'd be worried! I didn't like this one as much. Glad you did though! Thanks for the review!! I'm not a huge Lisa McMann fan (her books are well written, but the style does nothing for me), but this one looks incredible and I love anything that is mysterious and eerie and a little terrifying, so I'll definitely add this to my to-read list. Thank you for the review!